Beard dyes are a great way to express yourself as a man or combat the encroaching progress of time. 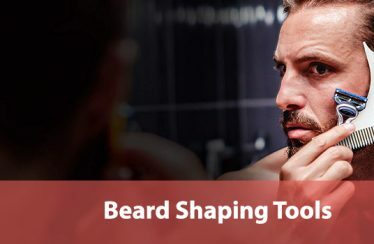 If you want to negate the gray hairs that are growing in your beard or just want to try a different color for your beard after years of it being the same, you’ve come to the right place. We’ve done all the needed research on beard dyes so that you won’t have to. In this guide, we’ll get into the specifics of beard dyes, first by explaining what you should look for when choosing a dye for your personal beard. Then we’ll show you some of the best beard dyes on the market; we have one for virtually every color of beard you might prefer. Afterward, we’ll go over some quick tips to make sure you can apply everything safely and correctly. Let’s get into it! We’ll start with a quick overview of our picks. Before we get into the actual details of each top pick, there are a few quick things to remember when you’re browsing beard dyes. These will affect how your beard dye is applied or how it affects your look, so read this guide thoroughly. Type: There are all sorts of beard dyes. The most common you’ll see are gels and powders, although there are a few paint-like dyes and a few foam dyes. In general, all of these can be effective with the right formula and application. However, you might prefer one kind over another due to experience or feel. Powder dyes, for instance, might dry your skin out so you’ll be better off finding a gel product. Color: Obviously, the hair color you pick is important! The dyes we list are all only good for one color of hair, although there are some brands, like Just For Men, which have similar products for each imaginable hair color. In addition, some hair dyes are only good for affecting certain hair colors, like black or gray. Make sure you don’t accidentally purchase a hair dye that’s unusable. Length of Time: Some dyes need to be reapplied each day, while others take weeks or months to wear off. Neither option is better than the other, but depending on your schedule you’ll probably prefer one over the other. Those dyes that take longer to wear off are often harder to deliberately wash out, too, so keep this in mind if you think you might like to switch beard colors again in the near future. Composition: All of the dyes on our list are non-toxic, but others might have some harmful chemicals in their composition, such as ammonia. Be careful when browsing not to buy something that could harm your skin or beard. In general name-brand products will be rated for safety over lesser-known manufacturers. 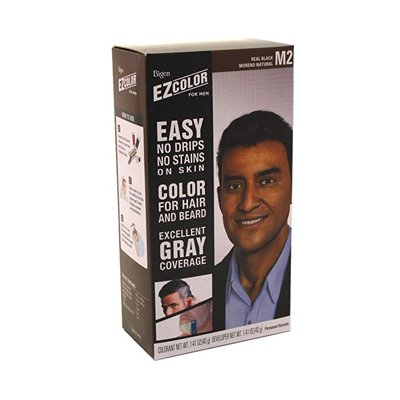 This pack is from the well-known “Just for Men” brand that offers hair coloring solutions for men from all walks of life. 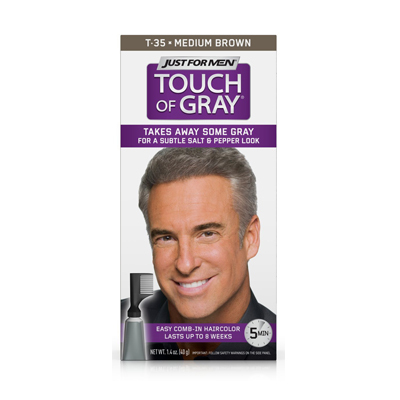 While their darker colors are seen everywhere, the “Touch of Gray” pack that we’re looking at is a little harder to find but it’s a great solution if you’re entering middle age and want a hair dye that can accommodate and accentuate your accumulated wisdom. Not every man wants to completely remove their hair color. 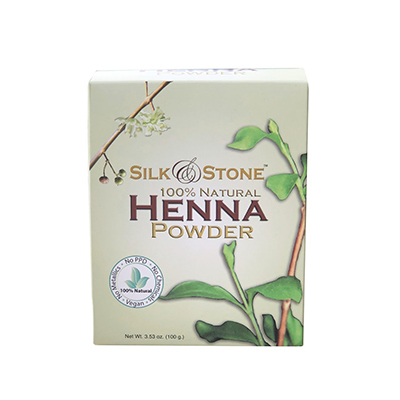 This is a great kit for adding to your natural hair tones but emphasizing your experience. It doesn’t turn your hair so gray that you start to gain more years than you’ll like, but it does add a nice element of maturity to any hair color. 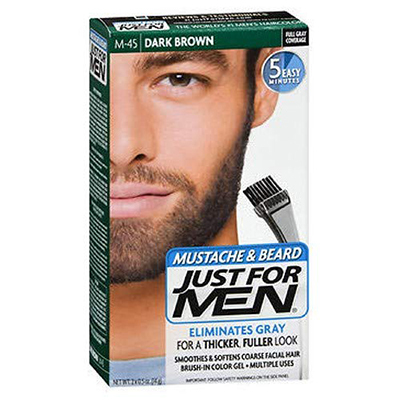 Why do we add this to our selection of beard dyes? 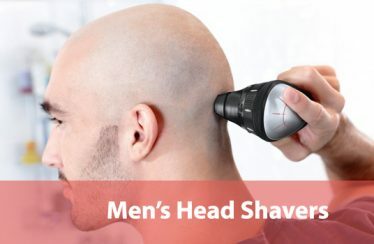 Oftentimes men have beard hair which is distinct from their head hair. This can make your appearance look a little out of place depending on the exact tones. You can use this dye on your beard just like you would with head hair for the same results. Your beard can advance to a mature version of itself by adding a touch of gray. The application is done with a comb that comes with the purchase. The gel itself is pretty thin and easy to scrape on, and you can do the whole routine in about five minutes. This is great for many men who don’t like to spend a long time in the bathroom. Perhaps best of all, it lasts for about eight weeks, so reapplication is a rare event. We really like the options for men who are aging but who want to emphasize their maturity in their beard coloring. Too often, colors are directed at younger men alone; this kit proves that you can still make a great dye for older men, too. Here’s the other Just for Men kit we’ll look at on our list. This one is specifically developed for use on your beard and sideburns via a brush that comes with the purchase. You’ll find that what it’s sized well, the bristles of the brush are a little wide and might have difficulty applying the gel if you have thicker beard hairs that need to be painted on all sides. However, the formula is really great. It’s ammonia-free and designed to make your beard look thicker and more groomed as you use the gel. After each application, you’ll find that your beard feels softer and more comfortable to the touch. There are two different colors you can try: a lighter or darker brown. If you don’t like your choice and don’t want to wait for weeks, you can always wash it out with soap and oil by following the instructions provided. Applying the gel is really simple with the brush and it lasts until your lighter or grayer hairs grow back. This is a good kit if you’re looking to stave off some of the more noticeable effects of aging. We really like how versatile and natural the gel looks on most beard colors. 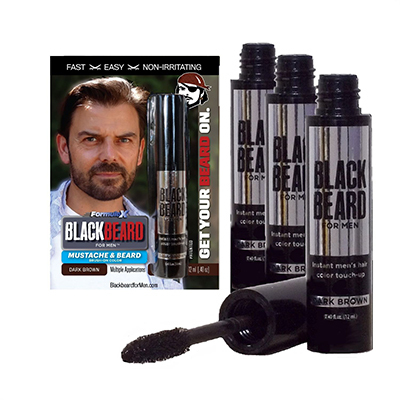 The Blackbeard applicator really puts an emphasis on speed and ease-of-use. This 3-pack comes with an applicator for each tube of black gel so that you can easily take one of the tubes with you in the car or in a small bag for portable purposes. The gel is applied via this brush and it acts instantly. It’s not technically a dye and is closer to a temporary paint. Since it’s so thin, it can latch onto your hair very easily and you can see instant results. The dark shade is full and thorough; there won’t be a lot of spottiness or patchiness in your beard if you apply everything properly. The gel is very easy to wash out at the end of the day so long as you add soap, and this is intended. You’re only supposed to keep this gel in for around the length of a workday. It’s a daily gel, which will be convenient for some guys but not for others. Since it doesn’t last for weeks you’ll have to add this quick routine to your morning list if you want semi-permanent results. We think that this gel fills a certain niche that a lot of guys will benefit from. We really like how easy it is to use and how quickly you can get results, but its temporary nature means that you might run into some problems if you try to extend the length of time you have it on without reapplying. This uses a pair of bottled products which you mix together to get the desired color formula. What’s cool about this is that, as you learn how the gels work together and the ideal timing of it all, you can customize your color by cutting down or adding to the recommended time on the box. You can get a darker or lighter shade of black than is advertised. That being said, the default black is a pretty good shade that does a great job of covering gray spots in a thorough, melding way without dominating the parts of your beard that are already black. You have to apply the gel with a comb or scraper and mix the bottled beforehand. This takes time that will add to your morning routine, but it’s fast enough that it shouldn’t bother most folks. The gels are made with a formula that’s non-toxic and doesn’t have ammonia. It won’t stain your face if you’re of a lighter skin tone, so it’s great for any man and not just ones who are dark-skinned. The good thing about this set is that it lasts for a few weeks at least, so even if applying it takes a few minutes you’ll only need to deal with that once in a while. This is a good combo kit for a decent price. If you have light skin and have had problems with staining your skin before while trying to get a darker beard, consider the Bigen EZ Color kit. This is a rather niche product that we felt was important for representing the interests of men who want red or orange beards. Since this is a color that’s not usually seen as easily as black or brown, we thought this Henna powder worked really well as a beard dye since it lasts for a really, really long time and produces great results. Henna powder is made from a type of soil and can sink into your hair to color it into a red or orange hue, depending on concentration, for weeks or months at a time. It’s really difficult to get out; you’ll need oils and a lot of scrubbing to return to your original hue. Therefore, it’s important that you’re sure before you apply this stuff! Henna also has some more passive benefits to its application; it’ll make your hair more moist and stronger, so your beard will be both softer and more comfortable to the touch and less susceptible to damage. If you’re a man with a big beard, you might really appreciate this aspect. The Henna powder takes a little skill and time to apply properly but given that it’s almost permanent we felt that the time tradeoff was worth it. 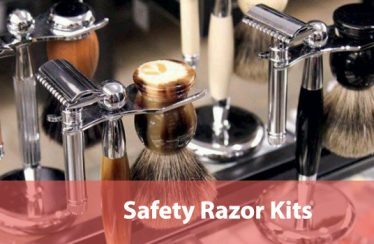 If you’re looking for a beard that’s red or orange, think about picking up a kit like this one. 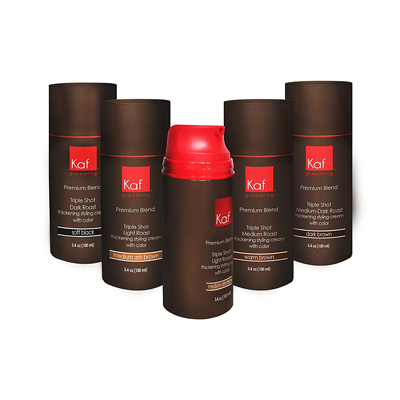 The Kaf Grooming Gel kit is an ideal solution if you have a gray or white beard and want to return it to a more natural look. This gel is easy to apply and once it’s rubbed in, you’ll see immediate results. The gel is rather thick and can feel a bit cold and chunky as you rub it in, but it eventually settles and dissipates and you can see how it colors your hair right away. We recommend using it sparingly and adding a little more each time you want more space colored. This will prevent you from spreading too much of it over your beard. However, since it lasts for such a small amount of time, any mistake is only temporary. It’s water-resistant and needs to be washed out with soap at the end of the day to be applied again the next morning. All of this does make the gel a bit of a temporary measure, but we think it’s a great pick if you’re a man that just wants a little coloring done and doesn’t need a full job for the whole beard. It’s affordable and usable by anyone, and you can even take it around with you due to each bottle’s small size. There’s definitely an intended use for this product, so it’s not an all-rounded product. But if it suits your needs, it‘ll be a great pick. This is a rather unique formula that uses a foam gel to apply coloring to your hair. It’s suitable if you want a really black beard, and you can apply it to all the hair on your head, not just your facial hair. All you need to do is apply it by hand to the desired area and wait for either 10 or 20 minutes. These time limits dictate how intense the change is. For a lesser coloration, stick with 10 minutes. But if you want fuller coverage, you can go for the full 20 and watch your beard turn jet black. This bottle contains enough of the foam for quite some time and it lasts for 1-2 weeks once applied, which is a great middle ground between lasting for just one day or lasting for weeks on end. The formula is a bit pricey, especially if you haven’t ever used a foam product before. But this gel is really worth the cost since it’s so effective at turning your hair deep, dark black. 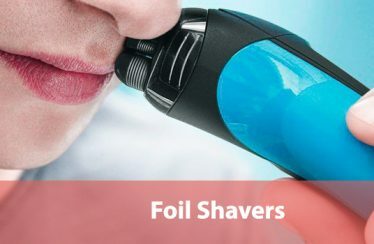 This can be of great use for men who used to have really black beards that are now turning gray. The bottle is small and compact and great for taking with you on business trips, too. We think the ease of use here is really attractive. There’s no mixing or prep required; just spray, apply, and see results. Now you’ve got some great new dye for your beard and want to apply it. Slow down! Read these next tips to make sure you don’t accidentally make a simple mistake and cause your beard to turn out the wrong color. You might end up with a poorly-dyed beard for weeks if you’re not careful. Clean Your Beard: First of all, your beard needs to be fully cleaned before you commit to a dye. This means you’ll need to thoroughly wash it in the shower and make sure that you’ve gotten rid of as much dirt and oil as possible, either of which might interfere with the dye application once the process gets going. It may be helpful to apply a washcloth to your beard to really dig into the pores and clean everything well. Trim Your Beard: Next, trim your beard and get rid of any stragglers or out-of-place hairs that are already making your beard look scraggly. This will improve your overall look but also make applying the dye evenly easier. Trimming your beard beforehand also helps you envision what you want everything to look like at the end, which will inform you of how dark you want your beard to be overall. Protect Your Hands: Wear disposable gloves during any kind of dyeing operation. This is because some dyes can be rough on your hands if they’re rubbed into your skin too strongly, which is easy to do as you scrub and push the dye into your beard. Even if you use a brush or comb, gloves are a good idea to prevent the skin of your hands from staining with the dark color that you’re using for your beard. Read the Instructions! : Some dyes have specific instructions, such as kits which require you to mix your formulas together. Read these carefully! Rushing ahead and assuming that you know the proper amounts of formulas is a great way to end up with a messy beard. When in doubt, it never hurts to look up more tips on the internet, like those in this guide! Be Patient: Finally, let your dye work its magic for the intended time limit, usually set in the instructions that will come with your kit. Don’t hurry things along or assume that some of the time is “enough” unless you’re intentionally going for a lighter shade of hair. The longer-lasting products will often have the longest required time for you to wait, but this will all be worthwhile in the end since you won’t have to reapply the dye very often. Armed with all of these great picks and helpful tips, you should be well-prepared to find the perfect beard dye for your manly mane. We’ve included some options for each type of hair and potential need; even if our picks aren’t for you, you should be able to find something that fits your needs by following our recommendations. Whatever you choose, enjoy your new beard and have fun experimenting!